Greetings, Boulder City! I am VERY happy to be here. I first visited the Southwest about 35 years ago. My mother and I spent the summer with friends in Arizona. The mountains, the sunsets, the cacti, and those funny little roadrunner birds enchanted me. 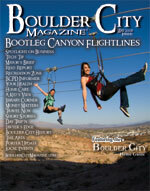 During that trip, I first visited Boulder City. We drove north, crossed Hoover Dam, had lunch, then returned to Arizona. Other memories from that trip include visiting Jerome, Arizona, and the Grand Canyon. Everything was incredibly different from anything I had experienced in Iowa. I’ve lived and worked in several states including Iowa, Texas and Wisconsin. I kept returning to the southwest. I discovered Las Vegas 20 years ago and have visited yearly since. My husband and I were married in Las Vegas. In 2005, we visited Boulder City with our son, again as part of a trip to see Hoover Dam. However, I never dreamed that I would some day move here to live! In January, I flew out to interview. I met the Staff and the Board, saw the building and talked to people around town. Everyone I talked to told me how much I would love living in Boulder City. Driving to the airport, I knew I wanted the job. I crossed my fingers. A few days later, Duncan called to offer me the position. So, here I am. I’m looking forward to getting to know the people in Boulder City and working with the Board and Staff to keep your Library growing and moving forward.